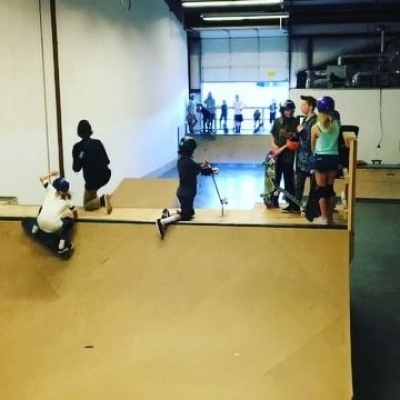 GIRLS & GROMS GROUP: Saturday afternoons 4:00 p.m. to 5:30 p.m. we are open for a Groms (8 and Under) and Girls (Any Age) skate session with a coach on hand to help take your skating to the next level. Price is $15. OPEN SKATE & PIZZA: Saturday nights from 5:30 to 8:00 p.m. our indoor park is open for kids 15 and Under to come skate, hang with friends and eat some pizza. Price is $15 (includes pizza). OLD GUY NIGHT: Sunday Nights from 7:00 to 9:00 p.m. If you're 28 and Over and need to session berfore heading in Monday morning than this is your time! Our heated indoor skatepark is all yours. Price is $10. SIGN UP FOR OPEN SKATE SESSIONS HERE.